Thanks John! I was about to PM you an invitation to come look at the thread. I softened the tips up a bit and took her shooting... put a couple dozen arrows through her at about a 27" draw (my draw is 29"). I like her! Just unbraced she follow the string by about 1/2"... not bad for the carbonized boo! My wife had the camera today, so tiller pics will have to wait until tomorrow afternoon. I did the final shaping of the handle and sanded everything down. May have some tiller adjustment to do tomorrow, but there's some room to move and still make a hunting weight bow. Here she is at 27"
I increased the positive tiller from 1/8" to 1/4". Right limb (upper) looks good to me. Nice gentle bend until right before the tip where there's a little extra flip in my form. Left is better; there's a stiff spot right before the flip at the tip... it's at a node and the boo suddenly gets quite a bit thicker. I glued on a built up leather rest and saturated it with superglue (there's a thread about that on here now) and shot it some more. No additional set from last time, but I haven't taken her past 27" yet... ~57#. I'd shoot her. Looks nice to me. Maybe just a hair more at midlimb on the left and just a touch from 4" outside of the dip to midlimb on the right. Thanks John! I'm real happy with the way this one is turning out. I think I'll put another 50 or so arrows through her, check to see if the tiller changed and stain her. Brett, I can't get that dang stuff not to feel oily! I've tried acetone, alcohol, dish detergent... nothing seems to work. The stuff warped pretty badly when I dried it out too, so I hope your floor still looks OK!! She's got over 100 shots through her now, is pulling 55# @28" and follows the string by about an inch just after unstringing. After sitting she comes back up just behind the handle. I'm not sure how the pic will show it, but she's stained mahogany at the tips (to match the handle) and then the stain fades to a nice golden oak color. 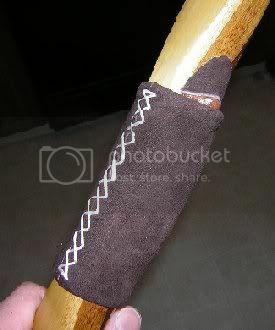 Deer leather laced handle wrap, rest and side plate. I'm calling her "SweetGrass" I just need to add the lettering and a couple of coats of wax. Thanks for following along! Great job Jeremy, that's a good looking bow! I'll second that, better bring it to the bunny hunt next year so as we can shoot it! Great Bow Jeremy!...fit and finish look top notch...not to mention the tiller..outstanding. I bet that Boo' makes smooth drawing bow. Very nice looking bow. I am jealous. The last one I was working on broke but I learned quite a bit and have already started the next one. It will have a hickory core, boo belly and raw boo back. Like you said, "there is always a next bow." Thanks guys! I'm real happy with this one! Larry, this bow won't be around for the Bunny Hunt... it'll probably be going up on the classifieds in a week or so - after I have fun shooting it a bunch more :D - but don't worry, I'll be bringing a bunch of bows! 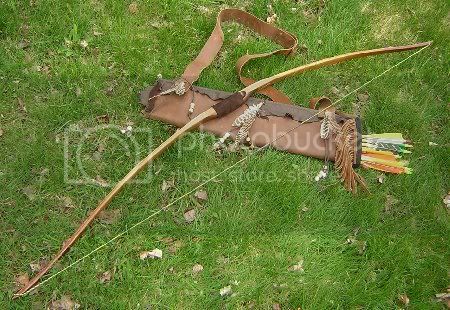 Warder, I learn something from each bow I make; that's what keeps it fun! ttt for anyone that wanted to see it, but hasn't. Interesting thing to note. After another 50 shots she still reads 55# on my tillering tree, but 52# when drawn by hand with an arrow and a stop at 28". Not sure if that's b/c the pully on the tree needs oiling or something, but it's something I need to keep in mind on the next couple of bows.